The Castelli Romani (Roman Castles) are the perfect destionation for an out of town trip. We refer to Castelli Romani as the group of 17 municipalities located on the Colli Albani (Alban Hills), south east of Rome. They are positioned on top of what’s left of the old Volcano of Lazio. A series of hills on top of which now rise enchanting villages. The area features also two craters that are now lakes: lake of Nemi and lake of Albano. For tourists, Castelli Romani is both a naturalistic and historical point of interest where you can take long walks surrounded by the wildlife and nature inside the Castelli Romani Regional Park. 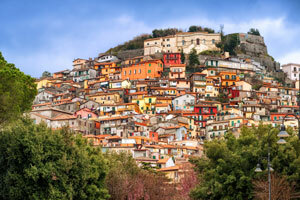 For those who live in the capital Castelli Romani represents the ideal destination to get away from the city muggy weather during the summer and to go have a feast during the winter. The area features plenty of events and festivals that will keep you engaged constantly. And even if there are no festivals the wide range of culinary choices never lets down. The municipalities. The municipalities in the Castelli Romani area are 17: Albano Laziale, Ariccia, Castel Gandolfo, Ciampino, Colonna, Frascati, Genzano di Roma, Grottaferrata, Lanuvio, Lariano, Marino, Monte Compatri, Monte Porzio Catone, Nemi, Rocca Priora, Rocca di Papa, Velletri. The Castelli Romani Regional Park. The Castelli Romani regional park is a protected area with an extension of 15000 hectars. It includes 15 of the 17 above mentioned municipalities. It opened in 1984 to protect the integrity of the historical and naturalistic area of the territory surrounding the Volcano of Lazio. The official website provides you with the map of the Park. The map features the web of all trails that you can walk, areas of tourist interest, sites of community relevance and areas subject to special protection. The tourist map specifically shows the position of the 15 villages, the gateways to the Park and a brief description of the sites worth visiting. Attractions. 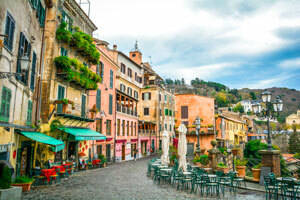 The Agenzia regionale del turismo del Lazio (Lazio’s regional tourism agency) has posted two videos that sum up all that you can check out when touring the Castelli Romani: spots of historical and cultural interest, landscapes, culinary traditions. The wild strawberries of Nemi, the horses of Pratoni del Vivaro, Rocca di Papa village, the view on Albano and Nem lakes: a very interesting focus on all the wonders of the Castelli Romani that you don’t want to miss. When romans think about Castelli Romani they instantly think of local festivals (called both festival and sagra). The collective consciousness of the Romann Castles is linked to a rich and historical culinary tradition. Music also plays a part in this liasion. There’s a bunch of traditional songs that are worth mentioning such as La società dei magnaccioni, (famous performance by Gabriella Ferri and Luisa De Santis in 1964) and ‘Na gita a li Castelli by Franco Silvestri. Wine and culinary tradition. The Castelli Romani culinary tradition is rich. Wine is the most celebrated product. The Frascati wine has earned both the DPO (Protected Designation of Origin) and DOCG (controlled and guaranteed denomination of origin). 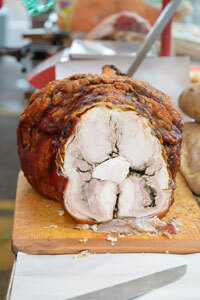 Furthermore there are other typical products, among which the Ariccia's porchetta (spit roasted pork) is worth mentioning (PGI, Protected Geographical Indications), Rocca di Papa’s chestnuts, Nemi’s strawberries, Genzano’s bread (PGI), Lariano’s bread and mushrooms (MCG, collective origin trademark). Sagra dell’uva (Festival of grapes): Marino, first Sunday of October. Sagra della ciambella al mosto (must-made dough): Marino, third Sunday of October. Sagra delle fragole (wild strawberries): Nemi, first Sunday of June. Sagra del pane (bread): Lariano. Sagra del fungo porcino (porcino mushroom): Lariano. Sagra della castagna (chestnut): Rocca di Papa, third Sunday of October. Contea della birra (beer): Rocca di Papa, September. Sagra della ciambella degli sposi (dough of the bridegroom): Rocca di Papa, third or fourth Sunday of September. Sagra dell’uva Italia (Italia grapes): Colonna, fourth Sunday of October. Sagra della bruschetta: Rocca Priora, first half of August. Festa del pane (bread), Genzano di Roma. Festa della rosa (rose): Lanuvio, first Sunday of May. Festa dell’uva e dei vini (grapes and wine): Lanuvio. Festa dell’uva e dei vini: (grapes and wine) Velletri, third Sunday of September. Fraschettas. If you’re looking for a place to eat in the Castelli Romani area, you have plenty to choose from. We recommend you to visit the fraschettas, the traditional and typical trattorias of the Castelli Romani. The fraschetta typically is an old-fashioned trattoria derived from a tavern where you can have very rich antipasto such as olives, coldcuts, cheese and especially porchetta. And as main course the typical roman pastas. All washed down with the trademark Castelli Romani wine. The peculiaruity of the fraschettas is that they were born during the middle age to allow farmers to sell their own homemade win. So they were basically small rooms where the barrels were kept. They were furnished with plain benches and tables where patrons could sit down and eat a meal. For a long time fraschettas didn’t have a kitchen so all they could offer were wine and bread. So the patrons brought their homemade meals themselves. Nowadays fraschettas serve food. But the menu is still very simple and limited to a couple of courses: antipasto and roman traditional pasta dishes such as carbonara, amatriciana or arrabbiata. We need to mention the fact that the antipasto is extremely rich so you may feel full even before touching the pasta… let alone your second course. The dessert generally consists of typical ring-shaped cookies to be dipped into wine. Bus: At subway stop Anagnina (line A) you can hop on buses connected to Ciampino; Rocca di Papa (Grottaferrata stop); Rocca Priora (Frascati-Colonna, Monte Porzio Catone, Montecompatri stops) and Velletri (Marino, Albano Laziale, Ariccia, Genzano di Roma-Nemi, Lanuvio, Lariano stops). At Pantano stop on the C subway line you can take the bus to Colonna and Montecompatri. Railway: From Termini station there are trains for Ciampino, Frascati, Albano Laziale, Velletri and several connections that stop inbetween the municipalities of Castelli Romani. You can find all information on public transportation on the Castelli Romani tourist portal.